Have you ever wanted to change just one thing about something you were wearing? Perhaps you want it a bit shorter. Maybe it could use some pockets. You'd prefer a different neckline. Well, eShakti.com is your solution for customizable clothing. With the launch of their Spring/Summer 2013 collections, I knew that it would be the perfect choice to look for a dress. Wedding season is underway and I needed a dress for the month of May. 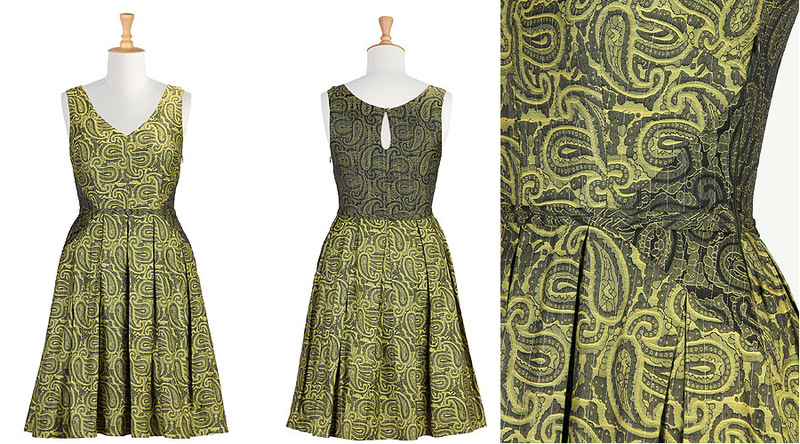 After browsing the site and selecting several potential dresses to wear, I decided to go with the Paisley jacquard printblock frock. Reverse blocks and vivid paisleys pattern our ultrafeminine jacquard dress accented with a slender, waist-defining self trim. V-neck, keyhole back with rouleau-button closure. Reverse printblocked side panels and back. Cotton, woven jacquard, light sheen, no stretch, midweight. Having recently giving birth less than two months ago, I was a bit skeptical of anything that was too revealing. My bust size has increased a bit now that I am nursing, so I opted to go a dress size up to help house my girls. Did you know that eShakti.com offers size 0-36W? There is something for every shape and size. 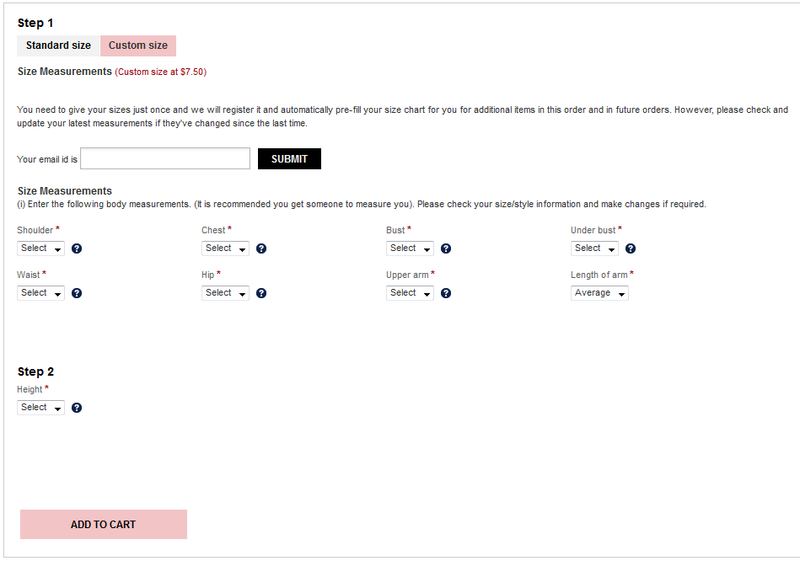 I also had to option to type in my measurements for a completely customized dress. 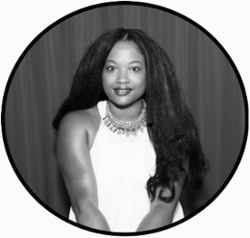 I submitted my order and waited for my dress to arrive.Most dressed ship in 7 business days because they have to be made to order if you include any customization such as remove/include embroidery, pockets or other embellishments. Once my dress arrived, I tried it on and immediately fell in love. I wasn't so much a fan of the length. I felt it overpowered me and made my short, (too) skinny legs look even shorter. So, I took it upon myself to tack the dress in the front with safety pins to give the dress a bit of an edge. I also added a patent leather belt to the waist to compliment my strappy heels. I also wore a black blazer on top of the dress when I was outdoors, where the wedding took place. The dress size was perfect at the top. It fit my bust perfectly and I did not feel like the v-neckline revealed too much. I would have liked the bottom to be a size smaller. It gave me a little extra cushion in the hip area. Next time I will go with custom measurements. Overall, I was satisfied with my dress. 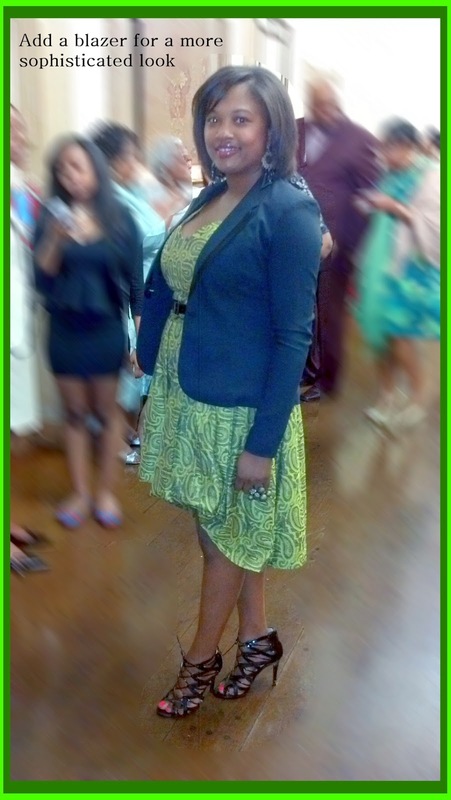 This particular dress I chose was provided by eShakti for a review. If I was purchasing it on my own, I would have chosen a less expensive dress. This dress retails for $94.95, but is currently on sale until May 19, 2013. Not that it's not worth it, but I feel like I could have purchase a cotton, printed dress for less. I still love it dearly. The next time you are looking for the perfect piece of clothing with a perfect, customized fit, choose eShakti.com. 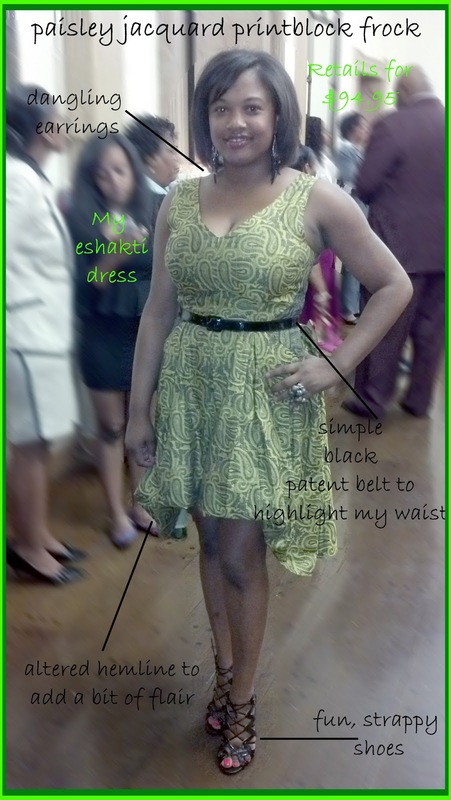 I was provided a dress, free of charge, to facilitate my review thanks to eShakti. The opinions and views are my own.